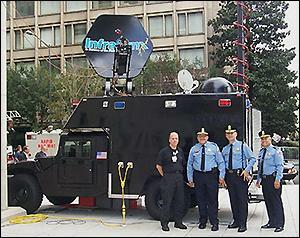 Washington, DC Police Pose Next to High Tech Equipment Provided by the U.S. Navy's Naval Research Laboratory to Monitor Protestors on September 27, 2002. Last week, the Partnership for Civil Justice Fund (PCJF) released a trove of some 4,000 documents it obtained under the Freedom of Information Act showing that the movements of the mostly peaceful participants in the Occupy Wall Street protests were subjected to an “enormous spying and monitoring apparatus” that included coordination between the Pentagon, FBI, Department of Homeland Security, local police, private security contractors and corporate interests. Increasingly, Americans’ time-honored First Amendment rights to peacefully assemble and dissent are playing out as open-season on protesters and mass arrests, followed by years of evidence destruction or tampering in court cases. As Wall Street On Parade perused the new documents from PCJF, one in particular raised red flags. Its subject line referred to the Occupy Wall Street movement as “Friggin Occupy” and it came from a veteran police officer. The PCJF is currently representing plaintiffs in a class action on behalf of some 700 peaceful marchers who were herded like cattle on the Brooklyn Bridge on October 1, 2011 during the height of the Occupy Wall Street protests and subjected to mass arrest by the New York City Police Department. On June 7, 2012, Judge Jed Rakoff ruled that New York Police Department officers are not entitled to qualified immunity from the mass arrests and ordered the lawsuit to proceed. The NYPD filed an appeal. A decision from the 2nd Circuit Court of Appeals is expected at any time. 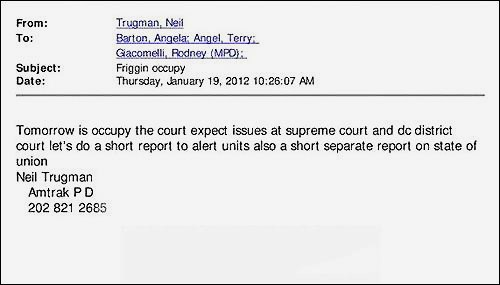 The bias suggested by this email toward peaceful protestors engaging in constitutionally protected First Amendment activities is exceeded only by the role that Trugman played in a previous, outrageously corrupted court case. The lawsuit involved the mass arrests of peaceful demonstrators who were not only herded like cattle but hog-tied with their right hand handcuffed to their left ankle for upwards of 24 hours – a tactic that should be challenged as torture and is clearly meant to chill dissent. It all started on the morning of September 27, 2002. Protesters were assembling in Pershing Park in Washington, D.C. to protest the inhumane actions of the International Monetary Fund and World Bank as well as global corporations’ exploitation of the poor. The Metropolitan Police Department turned out in riot gear and effectively arrested everyone in or near Pershing Park, grabbing approximately 400 protesters, tourists, passers-by and legal observers in the process. The Partnership for Civil Justice Fund filed a class action lawsuit on behalf of those arrested in the U.S. District Court for the District of Columbia. The case has become infamous in legal circles not just for police abuse but for the degree to which the police and lawyers within the General Counsel’s office for the MPD and District of Columbia’s Attorney General’s office, and potentially the FBI, would go to obstruct justice, destroy evidence and thwart discovery in a case which is costing taxpayers millions and has yet to be concluded after 12 years. After bringing evidence to the court that there had been serious wrongdoing by the defendants in withholding and/or destroying documents demanded in discovery, the Partnership for Civil Justice Fund settled the case for $8.5 million, which would result in an approximate award of $16,000 for each person arrested, expunging of arrest records, and stiff court monitoring of the MPD’s handling of evidence going forward for a number of years. A smaller group of plaintiffs who had been arrested on September 27, 2002, the “Chang, et al” case, went forward with their separate lawsuit under separate legal representation. This travesty has now played out for a dozen years in the Nation’s capitol under the nose of Congress and the U.S. Department of Justice. More skullduggery came to light when John Strader, a police officer with the DC MPD for over 18 years, was rummaging through an old file cabinet full of take-out menus and snacks and discovered the JOCC Running Resume in bound booklet form sometime between October 7, 2009 and December 31, 2009. According to the Facciola report, Strader delivered the JOCC Running Resume to Jeffrey Herold, an MPD Captain, who testified that he, in turn, delivered it to the MPD’s General Counsel’s office. The document was never turned over to plaintiffs’ counsel. Earlier this month, lawyers for the remaining plaintiffs in the Pershing Park case filed a status report with the Court. They told the Court that “after years of litigation, every direct item of contemporaneous documentary evidence of the circumstances of the actual arrest in this case – actual, hard copies of the Running Resume to computer records to audio and video tapes – has been compromised or is missing. Indeed, the evidence before the Special Master clearly demonstrated: The District lost (or destroyed) twelve hard paper copies of the JOCC Running Resume. It spent years denying the existence of any record of the Running Resume, including statements to both this Court and Judge Sporkin, although a District witness testified that he personally delivered the hard copies to ranking police officials.” Judge Sullivan has scheduled a status hearing in the case for June 3. Two outside entities with involvement in the Pershing Park case are the FBI and the U.S. Navy – yes, the military. PCJF told the court that in yet another case, Bolger v. District of Columbia, the District was sanctioned nearly $100,000 after the Office of General Counsel repeatedly — and falsely — denied the existence of an April, 2002 JOCC Running Resume. The PCJF was able to recover the Running Resume in that matter only after extensive litigation. One of the groups Neil Trugman lists on his LinkedIn profile is the FBI National Academy Associates – a taxpayer subsidized nonprofit, which, to the average reader, sounds like it has a formal relationship with the FBI. The FBI National Academy Associates is also soliciting unseemly corporate sponsorships ranging from an annual $75,000 to become a “Strategic Alliance Sponsor” (“truly like family”) to $50,000 for a “Diamond” sponsorship or $25,000 for “Platinum.” Lesser amounts for corporate tie-ins are also available. This conjures up reports of JPMorgan Chase (now a 2-count felon with a deferred prosecution agreement) doling out $4.6 million to the nonprofit NYPD Foundation just around the time that Occupy Wall Street protesters were being herded like cattle on the Brooklyn Bridge in mass arrests; this while JPMorgan sits cozy in the Lower Manhattan Security Coordination Center, a high-tech spy center where it and fellow miscreants on Wall Street work elbow to elbow with the NYPD to keep tabs on the comings and goings of law-abiding citizens in the Big Apple.